Fixodent Denture Adhesive with light mint flavor especially designed for complete care. Complete solution with 3 benefits: strong hold, improved comfort and foodseal. 10X stronger hold vs. no adhesive. For full and partial dentures. For even better results, please check our range of Premium Denture Adhesives: Dual Power, Dual Protection, Foodseal, 0%. Fixodent Complete denture adhesive is the perfect fit for you if you just don?t want to think about your dentures. Whatever you?re doing, whatever you?re eating, you?ll enjoy the confidence that comes from having your dentures held securely and comfortably in place. 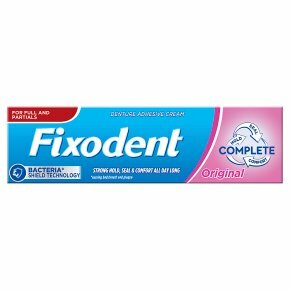 Fixodent Complete has a strong hold throughout the day, an improved comfort thanks a cushion between gums and dentures and helps to create a food seal preventing food particles from getting beneath your dentures. So you can simply relax and enjoy your life to the fullest. Try it now in the Light Minty Flavour. Usage instructions: 1. Clean dentures and gums thoroughly. 2. For best results apply dots of the adhesive at intervals along edges and surfaces of the denture which come into contact with your mouth. 3. Rinse mouth with water before inserting dentures. Our denture adhesive is designed to react with the moisture to form a thin, tight, food seal barrier. 4. Press denture firmly into place and hold briefly. 5. For best results wait 15-30 minutes before eating or drinking. Keep out of reach and sight of children. Do not use in the case of hypersensitivity to ingredients.